Don’t assume why some former players who sign for pay have a “cash only” policy.. 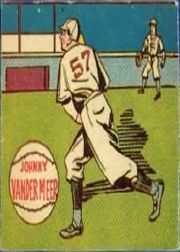 I met former pitcher Johnny Vander Meer at a 1980s sports collectors show. At that time, he wanted a donation to the Baseball Assistance Team (BAT). He growled to Luke Appling about the hassles of dealing with personal checks. I could see that he felt that collectors bounced checks on purpose, trying to cheat “Double No-Hit” out of a signature and BAT out of a donation. “Cash is easier!” he proclaimed. Sure, the temptation of a retiree to “forget” to tell the IRS about all the fivers that come in the mail weekly is a possibility. I won’t assume that all autograph signers have tax fraud on their minds. Avoiding problems with the bank could be another motivation. Readers: how do you feel about sending cash in the mail for an autograph? I understand a cash-only policy for in-person autographs, but not for TTMs. A couple years ago, I sent cash to Andre Dawson and Ron Karkovice and never heard back. I sent a check to Rollie Fingers and got nothing back also, but it’s better to know that he actually cashed my check than to wonder what happened to my cash. Guys who keep your money and send nothing back are the worst.